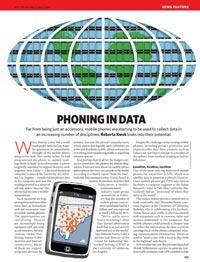 Personal technology: Phoning in data : Nature NewsPublished online 22 April 2009 | Nature 458, 959-961 (2009) | doi:10.1038/458959a News Feature Far from being just an accessory, mobile phones are starting to be used to collect data in an increasing number of disciplines. Roberta Kwok looks into their potential. Last June, Albert-László Barabási and his colleagues at Northeastern University in Boston, Massachusetts, published a study in Nature that analysed the movements of 100,000 mobile-phone users (1). Eagle is now working with Barabási’s group and others to examine phone-operator data from a range of geographic areas, including records for millions of mobile-phone users in Europe and two East African countries. Eventually, Eagle hopes to detect common behavioural patterns, such as changes in movement or calling frequency, that occur during disease outbreaks, which could help alert public-health officials to the early stages of an epidemic. It would be interesting to see if movement or calling frequency could be used to detect behavioural patterns before food shortages, harvests, etc.